The house probably doesn’t look like much to you, and I have to laugh at the state of the yard, but it was a wonderful place to grow up. I keep this photo on the wall in my kitchen just because it makes me happy. So you can imagine how over-the-moon thrilled I was when the talented artist Fifi Flowers sent me this painting. I love it! Fifi Flowers has agreed to paint a portrait like this for one of my lucky readers. That’s right–if you win, she will paint a house for you on 6″ x 7″ archival paper–a $150 value (you can upgrade to a larger size for a slight fee). You may want her to paint your current home, your childhood home, or someone else’s to give as a gift. We had my in-laws’ home painted as a Christmas gift one year and they loved it. To enter, simply leave a comment on this post before midnight Monday (May 11). Want an extra entry? Visit Fifi’s Etsy shop, look around, and then leave a second comment telling me what your favorite painting of hers is. I’ll announce the winner on Tuesday, so stay tuned! DesignTies’s last blog post..Grab your swimsuit, it’s a pool party!! Wow that is really pretty! What a great house to grow up in. I’ve lived in a lot of houses, but maybe my husband would love his childhood home painted. Looking forward to her Etsy store! That Fifi….she’s amazingly talented! Your house is very charming, I love the stacked chimney! I would so love to have an original painting from her…count me in PLEASE! What a wonderful thing to be hooked on this week Julia! Fifi’s house paintings are so joyful. She created a wonderful rendition of your sweet childhood cottage. 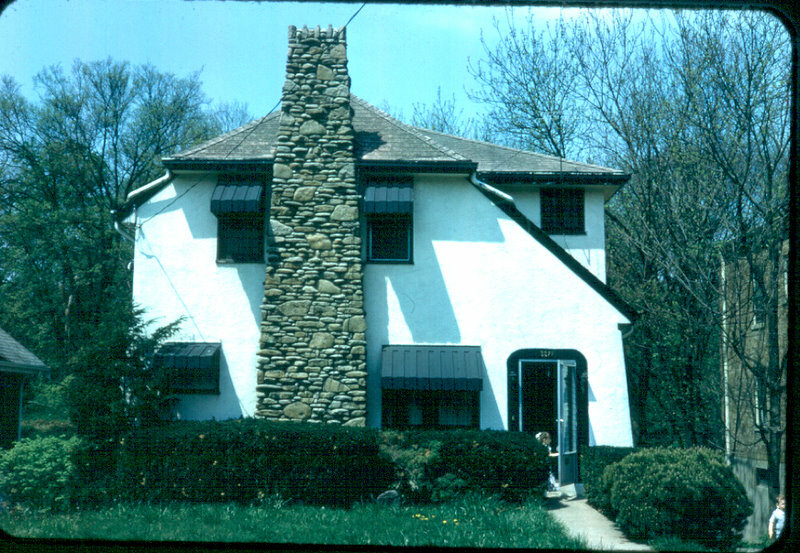 If I were lucky enough to win I would be thrilled with a painting of my childhood home – event hough it was not a cottage like yours – mine was a 1975 wannabe spanish/ranch tract home – but I loved it as if it were the finest mansion! Thanks so much for hosting this giveaway…I am off to browse through Fifi’s lovely work. Fifi is so fabulous! Her paintings would be fun in any home. Fifi has a FUN style to her paintings. Just went to her Etsy store….I really like the “Garden Chair” painting. Thanks for the giveaway! What a lovely giveaway…Fifi is amazing! I would love to win the painting. It’s so quaint! Puna’s last blog post..Do You Have 2.5 Million Dollars? This is the best giveaway – art about our own home, a place we love. Now off to Etsy. FiFi has some GREAT stuff!! Hmm…I might just have to skip paying for groceries and buy Stolen Kisses! Julia – I couldn’t pick just one painting everything was so fun! I adore both the Bicycle and French Cafe note cards. Do you know if Fifi paints anything with a seaside theme or is her work strictly French inspired? Thanks again and Happy Mother’s Day!! Terry Kearns’s last blog post..Foyers – wasted space, psychologcal boost, or what? Very sweet giveaway. I’d love to win one for my parents! Oh, what a neat giveaway! My parents had a painting of their old Florida Keys house made and I just love it. I’d love to have one of my own! I love Fifi’s houses almost as much as I love my house. What could be better than to combine both – you could see my smile for miles!! Peacock Blue’s last blog post..I Really Heart Peacocks…. Ok, Fifi’s paintings are soooo cute! I love the one called “On the Beach at Cote d’Azur”. It reminds me of Old Hollywood with the swimming cap and vintage swim suit! Her little dog painting (on her blog) is super cute too! Talent, talent, talent! Oh, and the painting, very nice! And what a great memory. My favorite painting on her Etsy site is On the Street with Eiffel. Her paintings are full of color and delightful. They would make wonderful Open House cards…. Suzy’s last blog post..Hooked on a Butler’s Pantry…. How exciting it would be to win one of her prints! FAB-U-LOUS!!!!!!!! I LOVE this…..and sooooo hope I’m the lucky number! I am a romantic at heart and absolutely LOVE Fifi’s “Stolen Kiss” painting! Entry one, nowofftofifi’safter iget the cookie crumb from under thespace bar. I think it is so special that you have a photo of the house you grew up in. So many people are not fortunate enough to have that. Fifi did a great job painting it too! I LOVE the Chairs in Paris painting…toooo much fun! What a talented girl Fifi is. Of all of Fifi’s paintings, Donna and Fifi jumped out at me. LOVE IT! What a cute bike in front of that little shop! Precious! Paris Apartment Rendezvous but “the stolen pink car” was a close second. (yaeh the crumb is gone.) now if i can remember my paypal info i’m going back for some note cards. Thanks Julia for the great party. This is always so much fun. Have a great weekend!! If I won, I’d surprise my mom with the house she grew up in. Heck… maybe I should do that even if I don’t..
Love the French paintings the best. The hip chick ones seem fun, too. Love the rendering of your home. As kids I don’t think we care too much about the state of the yard. Fifi did a great job on your house. That painting will be a keepsake for sure! And my favorite from her shop is On the Street with Eiffel. I’m always taken in by Fifi’s paintings – love them – they feed my desire to travel to Paris!! And I can’t tell you how excited I’d be to have a little portrait of my equally little house (once it’s freshly painted of course… a summer project!)!! Please enter me twice for this draw, Julia… it was hard to choose, but I’m loving the colours and whimsy of “Brasserie des Arts”. Victoria @ DesignTies’s last blog post..Grab your swimsuit, it’s a pool party!! Love it! What a treasure it would be to pass on a picture of the house my kids grew up in. Thanks for the chance. Very talented artist! Swoooon! I am just bonkers for Fifi’s work! I featured her on my blog just the other day too! I am a bicycle nut. All of her ‘velo’ are pure eye candy in my book! Oh, how I love FiFi’s artwork!! She is so talented! I already have a couple of her pieces, but would love to have portrait of my home as well! Right now, I’d have to say my favorite is FiFi’s “Vin et Fromage Shop”. However, I LOVE “Pink Trees in Paris” – it’s in my office right now! 🙂 So talented FiFi is!!! I woul love to win! My favorite is On the Beach at Cote d’Azur. Having a portrait of ones childhood home would be most comforting thing, don’t you think? What a great idea..a portrait of your home. Everytime you look at that painting you will be reminded of your childhood. Something we yearn for as we grow older. Pink Chairs in Paris is my favorite! Caroline’s last blog post..Still workin on some projects..
What a wonderful give-a-way! The painting of your house looks fun and happy! This is a great giveaway! I would love to have a picture of my childhood home. Or maybe our farm here that we are about to sell. Hard to say. But I’d love to win! BTW, I love your blog so much. It’s a perfect escape for me, a place to come for fun and beauty. Thanks for all you do. Alpaca Farmgirl’s last blog post..Finally A Daughter! My favorite of Fifi’s paintings is Berry Cushions with a view, though I also really like Pink Chairs in Paris! Her work is lovely. Fifi’s paintings are fabulous – I would love to be entered! I love house portraits! It would be a wonderful gift for someone! Jamie’s last blog post..Our new kitchen! That would be a terrific prize! I’m in. My favorite from her Etsy shop is “Garden Chair.” Thanks! What a cool giveaway! And what a awesome artist!! Oh! My! Gosh! What an amaaazing giveaway!! Fingers crossed!! Good luck everyone! I’d love to be entered. She’s so talented! I love the painting of your childhood home. How special! Hope I win! What a great giveaway. 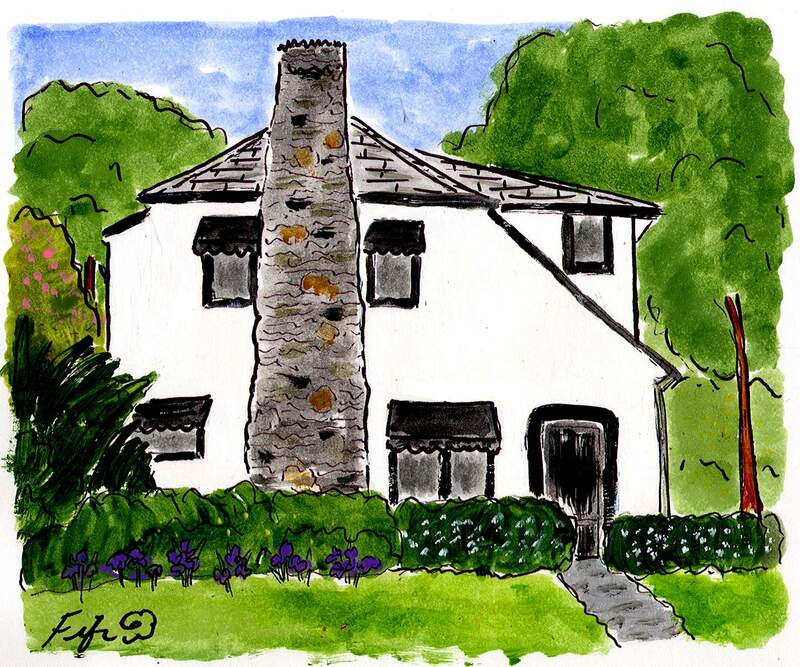 Her painting of your childhood home is beautiful. My favorite is the French Wine and Bread. Comment #1 – I’d love this! Comment #2 – I love the Garden Chair painting the best. How cool is this! I would love to win this. I have been wanting a painting of my current home for the past three years I’ve lived here. This is the first house I’ve owned that I actually love the exterior. I even have a wall that I’ve set aside for my house painting to go, no kidding! Struggler’s last blog post..Friday challenge: dare you count your clothes? Here’s Comment #1. Pick me! I have long coveted FiFi’s house paintings. I love our home and this would be an amazing thing to have. This is great. I’d love to win. My parents will soon be moving from my childhood home; they have been there for over 50 years. They are getting up there in years, and it is tough for them to deal with the upkeep, and the stairs are becoming difficult for my mother. This would be great for them to have as a reminder of all those wonderful years spent there. Here’s Comment #2. I like the French Wine and Bread and the Wine and Roses in Paris. What can I say? I’m a wine girl! If two comments raises my chances to win, three must cerainly be a good thing. Thanks for the opportunity, Fifi and Julia! I know just the place to hang this when I win. Here’s my second comment. I was drawn to “Painter’s Cafe” and “On the Street with Eiffel”. Lovely. I love Fifi’s work. How wonderful it would be to win a truly wonderful keepsake!! 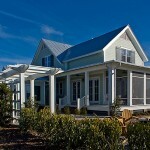 We’re almost done building a sort of Craftsman style home, which would look great as a painting! Great gift idea, too. And my favorite painting of hers is Cafe de France because of the bright colors, and it reminds me of our trip to Paris. Keeping my fingers crossed!!! What a wonderful giveaway! I enjoy following your blog. I love Fifi’s paintings!! It would be so nice to get a painting of our house. My favorite of Fifi’s painting are the 3 hanging in our bathroom of Paris! (Fifi Appearing at the Moulin Rouge, Le Consulat Rendezvous, and Notre Dame Embrace that I framed with a cream mat with a little red mat in a black frame) But of her newest ones I love the Aux Provences Brasserie and Pont Neuf Apartment. ooooh, I love this idea. My husband and I just bought a house and it would be so cool to have this lasting memory of the first home we bought together. Fifi’s paintings are so fun that it would be so hard to choose which house to have her paint. Fifi is an amazing artist, everything she does is so colorful. She painted a photo I had taken of some peonies from my mom’s garden, and now the painting is hanging in a bedroom somewhere in Paris! I would love for her to paint the victorian apartment building I live in in Hartford, and one of my favorite paintings of hers is no longer available – Marie Antoinette lounging on a chaise. But of her current collection I love On The Street With Eiffel. 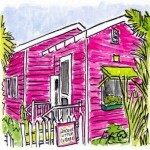 I love the painting of your house…she did a great job! I like her “eating sweets” painting. That *would* make a wonderful gift! How cool! Sarah’s last blog post..Ohmygosh! New neighbors!! I really like the Pont Neuf Apartment painting. 🙂 I love Paris. What a great giveaway I would definately have one of my grandparents houses painted, good memories at both. I love the house you grew up in. I’d love a painting of my grandmother’s house which no longer exists. I’d have to search some old photos for it. It has the best memories for me and most of my family. Super fun giveaway! And wow, the competition is fierce! I just love fifi’s work… her favorite piece from her etsy shop, hands down is the Eiffel Tower peaking through the gardens! Love it! jill’s last blog post..ETSY shop giveaway!!! That house is so cute and the portrait is just perfect. I love house portraits! Would make a great Mom’s Day present! This is such a fun idea. I would love to have a portrait of my house! Now I need to go check out her website. What a fantastic portait! I would have my current house done, then hang it in my family room. Its hard to choose a favorite from the Etsy shop. So many great ones. I love Stolen Kiss or the Hip Chick collection. But my favorite would be the Pont Neuf Apartment. She truly has a gift of recreating real life and making it look so whimsical. I love the house it is so great! 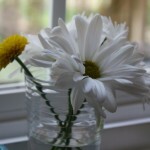 Angela @ Imaginecozy’s last blog post..What to put on the table? I need to win that painting! I would have to say my favorite is Brasserie des Arts. I love the red! So cute!! I would love a painting of my husband’s family’s ranch! Lindsay C.’s last blog post..Blah Half Bath…I Need Your Help!! PS – I love her “Garden Chair” painting!! So cozy!! Oh I’ve been a lurker for so long but this giveaway is so fabulous, I just couldn’t skip it! I love Fifi’s stuff, have I seen it here on your site before? oh, and my favorite on her Etsy site is the Goldfish Luncheon. So fresh, but echoes Matisse at the same time. I’m booking my flight into Marseilles this minute. She is an AWESOME Artist. I would have her paint our house now. My favorite of all. Fun! How cool that she did that! I checked her Etsy shop and I love Fifis PINK CHAIRS IN PARIS. From Fifi? Hmmmm . . . if I’s selfish, Wine and Roses . . . if I’m generous and get something for my daughter, Stolen Pink Car! OMG I would LOVE to win this drawing! It will be cherished! I would have to say my own house that we are living in right now. 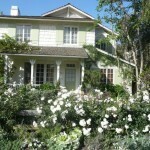 It is a 1910 white farmhouse and I take its picture all of the time. Would love to have one done by Fifi. I love Fifi’s work and the stone chimney in her painting above is so awesome – it has movement and character. It’s a happy painting for a much loved childhood home. Perfect! My favorite Fifi print? Stolen Pink Car. It appeals to my bad side. For my second entry, I would like to say that my favorite piece of art of Fifi’s is her “Garden Chair”. Fifi is just so talented. To do homes, it just makes me so happy ! What a completely awesome idea. I would love to have a picture done of my childhood home for myself or my sisters. I love your blog. Fifi has such a whimsical style. Her paintings are eye candy! My favorite one was Aux Provences Brasserie. What a wonderful job she did in capturing the feel of the house! That would make an excellent gift. I LOVE Fifi’s artwork! What a wonderful treat it would be to have her paint a portrait of our house. It’s so hard to pick a favorite, but I’ve been eyeing her bicycle series for a while now. I have this daydream of riding a beautiful bicycle with a basket on the front filled with flowers. I would adore a “Fifi”- I love the sense of whimsey! A great day for me to discover your blog! I’d love to win a painting of my house! I’m a newlywed and new homeowner so that would be really special! wow! what an amazing prize!! I would love to win this!! what a great way to preserve a memory! i would love my childhood house done.. I know I’ve told her this before, but the chairs in Paris are beautiful! Love that one! Your childhood home looks beautiful Julia! What a wonderful painting to have as a reminder. I would love my house painted by Fifi. What a wonderful drawing. Thank you! Puna’s last blog post..Good News & Danny’s Birthday! Fifi’s art is so cute! I’d have to get her to pain my childhood home. The hell hole I’m living in now will hopefully become someone else’s “dream home” very soon! Stolen Pink Car is my fave on Fifi’s etsy shop. Such dainty gloves stealing a pink car. How unusual! Wow, what a great giveaway. I would love a painting of our old mountain farmhouse! Fifi’s Brasserie des Arts is my favorite painting. Thanks so much for the 2nd chance! I love your house, what character! and that is soooooooo nice to have a special house portrait by Fifi. My favourite painting of Fifi’s is “Pink Chairs in Paris”. That is right where I would like to be, reading about your hooked on Fridays…. Just Love how it jumps off the page. The colors seem to ooze happy thoughts. Thanks for puting this offer and the blog party together- Love it all !! OH, how I would love for you to enter my name on the giveaway of Fifi’s house painting! This is the first time I have visited! Fun! I will be back! I would love to be entered in the drawing and I also visited Fifi’s etsy and love pink trees in Paris and love both chair paintings! karen…. karen’s last blog post..A Little surprise in the garden and some flea finds! Love these paintings. What a great gift idea thanks for introducing us! OK I revisited and my favorite is “stolen pink car”. I’d love to give this as a gift to my brother and sister-in-law. They bought a charming, little house in a great neighborhood when they first got married and have done little, DIY fixes here and there while they wait for the market to turn around. Some day, they hope to add onto it amd I think it’d be sweet to capture it’s current look for them to have too look back at. I think I forgot to comment before. So glad, I came bck to check out the newer entries. Plus, I certainly love a chance at winning a fabulous painting by Fifi. This site has already taken up so much of my day today b/c it ‘s fabulous, of course. Now I’m on the bunny trail of checking out everyone’s passions—I’ll be up until 1:00 a.m.! Thanks for the eye-candy. Lara’s last blog post..Funny signs. I love those! We just bought a new home last year and would have her do that! Thanks! I love the Tiffany Blue chair painting! She is really talented! Fifi’s work is simply beautiful! Fifi’s GARDEN CHAIR is my favorite from her Etsy site. What a great house portrait! I’d love to have one of our home. For her Etsy work, either Pink Trees in Paris or The Stolen Pink Car! Love Fifi’s work! I’d love a painting of my home. It is our first home, and my husband and I are busy renovating and redecorating to make it special. What a fun picture. A great way to capture your favorite house. I’ve been a big fan of Fifi’s art for some time now. It’s just such happy stuff! I really like her “Wine and Roses in Paris”. Those roses are charming! I would LOVE a painting like this of my home!! I’ll vote for Stolen Pink Car as the favorite!! I have a love affair with the house I grew up in as well. Homes become a member of the family and I think even more so when we are young. And Fifi? Oh my, she is le FAB artist and one of my most favorite bloggy people! Petunia’s last blog post..Fashionable and Pink Tea Time! Love this! Absolutely love it!!! Fifi is a talent isn’t she? Headed right over to her little blog spot! Robin Rane’ ~ All Things Heart and Home’s last blog post..Chocolate Chip Banana Cake! Okay just dropped by Fifi’s little blog shop and my favorite is the Bright and Bold Flowers! I’m really into sunflowers lately and there’s a great one included in this montage’! Fifi is an amazing artist. I love her work. I’d be thrilled to win this wonderful giveaway! I just took another look at Fifi’s shop. It’s difficult to pick a favorite!! I love the Bright and Bold Flowers! Wow-her artwork is gorgeous! Love it. What great work she does. Thanks for doing this. thanks for the chance at a second entry i love the pink trees in paris. a painting of the house I Love, be still my heart. Love Fifi’s work – colorful, whimsical and pretty! 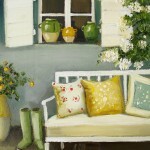 I’m enamored with Fifi’s Garden Chair painting. I’m obsessed with chairs and this painting is so lovely! No wonder you were so thrilled with your house painting…it is fabulous. My favorite painting of FiFi’s is probably the latest one she has blogged about..looking out the window above the desk to a bright blue sky. Thank you for the chance to win a piece of her art…. bj’s last blog post..5/11…COOKIN’ BLUES.. I love Fifi’s artworks! She is a very talented lady. LOVE the simplicity of the designs! Oh how I would love to win one of Fifi’s paintings. I went to her Etsy shop so i would have a second chance and I like the painting of the rooster against the black and white check background. Your childhood home is charming. Rhondi’s last blog post..It’s Time To Party! What a simply perfect idea. What an adorable picture! I was just introduced to your site last week by a firend and have to say I love it! Thanks for sharing all of the great house pictures. Aahhh!!! I sure would love to win!!!!!!!!!!!!!!!!! What a house with great character! I can now see why you are Hooked on Houses! Sorry to have missed the Friday Blog party, but I do have an interesting house for you to check out on my blog today! LOVE Fifi’s work! Thx for sharing it w/us! I was just searching for this information for some time. After six hours of continuous Googleing, at last I got it in your web site. I wonder what’s the lack of Google strategy that don’t rank this type of informative web sites in top of the list. Usually the top sites are full of garbage.